1. Cook 3 of the eggs in a saucepan of boiling water for 9 minutes. Drain and cool a little under running water then peel and roughly chop. 2. Meanwhile, preheat the oven to 200°C, gas mark 6. Roll out the pastry to make a 38cm square and cut into 4 equal squares. Beat the remaining egg. 3. Mix the chopped eggs, cheese sauce, tuna and most of the chives. Divide the filling between the pastry squares, brush the edges with beaten egg then pull the four corners up and inward to meet in the centre, folding one corner over the other like closing an envelope. Firmly press the edges together to seal (using more beaten egg if you need). Repeat to make 4 parcels. 4. Transfer the parcels to a parchment-lined baking sheet and brush lightly with egg. Bake for 25-30 minutes until puffed, golden and piping hot (the parcels may open up a little as they bake). 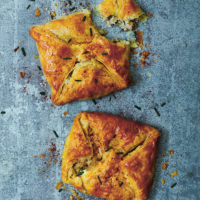 Scatter a pinch of cayenne or paprika and chives onto each pasty and serve.